It was economist/journalist Fred Harrison’s The Power in the Land: Unemployment, the Profits Crisis and the Land Speculator in 1983 that inspired me to take up research into the quantum of Australian real estate sales. 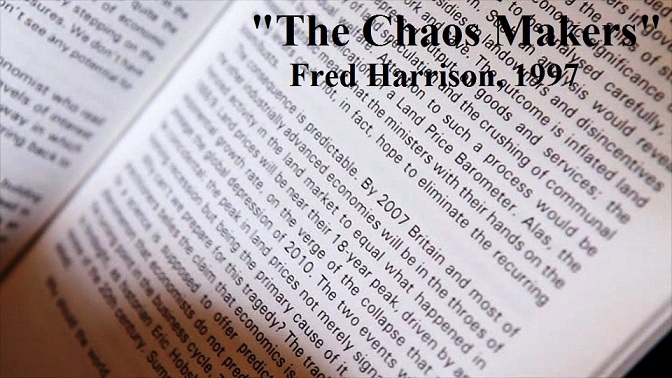 Harrison was one of the few people who called the world financial collapse–virtually to the day–from a long way out, demonstrating the manner in which the taxation of labour and capital, coupled with rent-seeking in land had generated the collapse. He warned Gordon Brown on Brown’s infamous statement “No return to boom and bust” and subsequently exposed Brown’s complete failure as Britain’s Chancellor of the Exchequer and Prime Minister. If Europe’s political leaders wish to stop making themselves the banks’ fools, they could do no better than read Harrison on how the banks are STILL ripping the people of Europe off.